Happy New Year everybody, thank you all for hanging in there with me and I hope that 2019 is especially good for you all! “Loving Vincent” is a full length animated feature film in which every scene is hand-painted and is based on the Dutch artist Vincent Van Gogh and his paintings. Now I didn’t know that much about his life other than that he was an impressionist painter who was supported by his brother in his pursuit of his passion and that he had spent time in an asylum because he had a nervous breakdown and had cut off his ear. Naturally there is a lot more to the man … genius or madman the line between is pretty thin. He did not start to paint until he was 27 and died from a self-inflicted gunshot wound when he was 37. He painted over 860 paintings, wrote 800 letters in that time and sketched over 1,000 pieces. Incredibly prolific and disciplined, attributes I admire and wish I possessed. 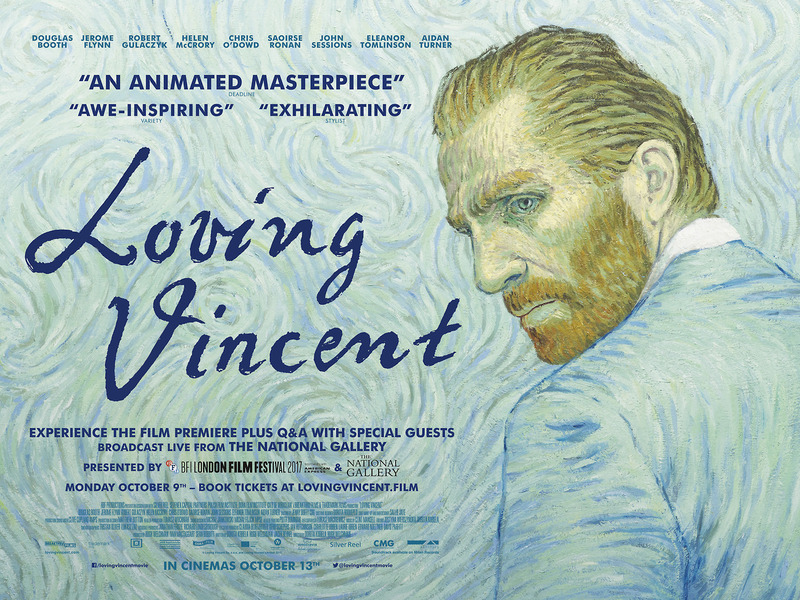 This past week I watched “Loving Vincent” … released in 2017 – the film features 65,000 frames made by 125 painters over the course of 6 years. It was a passion project for the filmmakers and was funded in part through a Kickstarter fund that helped to pay for the numerous painters and animators required. It is fascinating to watch many of his famous paintings brought to life in this manner. Vincent van Gogh’s artworks provided endless inspiration for artists, but his tragic life story has also captured the hearts of countless musicians, writers and filmmakers too. There are many movies on his life. Don McLean’s 1971 hit song “Vincent” is inspired by van Gogh’s unique perspective on the world. He sings, ‘they did not listen, they did not know how… perhaps they’ll listen now’. His canvases with densely laden, visible brushstrokes rendered in a bright, opulent palette emphasize Van Gogh’s personal expression brought to life in paint. Each painting provides a direct sense of how the artist viewed each scene, interpreted through his eyes, mind, and heart. His paintings were often completed relatively quickly, as his style was spontaneous and intuitive, which gave some viewers pause. Much of Van Gogh’s work has been lost, as many people who owned his work initially thought it to be worthless. His own mother is said to have disposed of full crates of his paintings. Though it is impossible to assign an exact monetary value on an irreplaceble, unique artistic masterpiece “Starry Night” which is arguably Van Gogh’s most famous work of art is estimated to be worth well over 100 million dollars. In 1987, “Sunflowers” sold at auction for the incredible amount of 39.9 million dollars. Even though Van Gogh himself lived in poverty most of his life and sold only one painting in his lifetime he has since become one of the most loved artists of his time. A sad reminder that most artists never get to reap the rewards and fruits of their labour. In May, 2015, Vincent Van Gogh’s painting, “L’Allée des Alyscamps” sold at a Sotheby’s auction for $66.3 million to a private collector from Asia. This is roughly 6 times the price it drew in 2003 when the hammer fell at $11.8 million. In November of 2017, The 1889 painting, “Laboureur dans un champ,”an oil canvas by Vincent van Gogh fetched $81.3 million in an auction just short of a record sale price for the artist. “Café Terrace At Night” (1888) is my personal favourite of his works; it is a powerful scene which pulls you into it as if you yourself were strolling the cobblestone streets. The cafe in Arles still exists today and is a mecca for his many fans visiting the south of France. Sold way back in 1990 for $82.5 million USD (approximately $148-$152 million in today’s money), Vincent van Gogh’s Portrait of Dr. Gachet was painted in 1890 — the same year van Gogh died. An auction sale, this work sold for much more than Christie’s anticipated — low estimates were predicted at $40 million, and some thought that was too high. Japanese businessman Ryoei Saito thought otherwise and won the auction; however, Saito died in 1996 and the whereabouts of the portrait is unknown though he is stated to have claimed he wanted the work cremated with him. If true, a tragic loss to the art world.